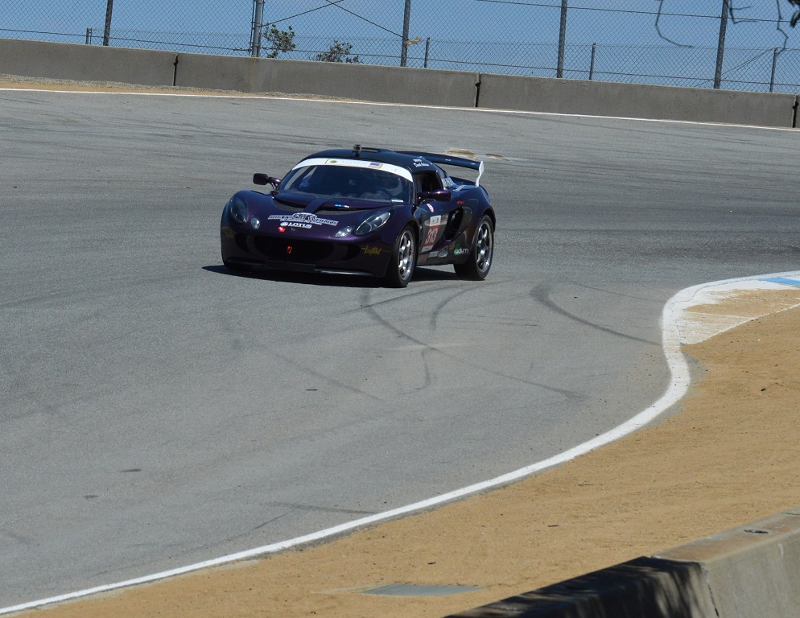 I have pictures from track days and other GGLC This page is for 2014 and 2015. While it was a 500 mile drive to get to the track the opportunity was one I just could not miss. DietschMotorsports brought me Elise #214. The track has several long-ish straights and four 180 degree turns: these turns demand a certain approach that I did not really understand till after Sunday's race was over and Kevin W (class winner) explained! I found out the hard way that if the crash-sensor is installed and one gets on the wrong part of the berms it can trip the sensor and turn off the fuel, ending one's race. I should have stayed off the berms a bit more on Saturday. Specially disappointing as I got a really good start in Saturday's race. Photos at Thermal Club by Caliphotography. Second is on the first lap of the Saturday race: #214 is third of the seven Lotus in this picture. Third is a bit later in the Saturday race. It was a great trackday. Sunny, dry, and 65-70 degrees F with just a little wind in the early afternoon. The day was essentially sold out. The Lotuses on track ranged from a Lotus Cortina and Series 4 Seven from the 1960's to a V6 Exige (brand new). I was in a Dietsch Lotus Elise #127 and it ran flawlessly all day. 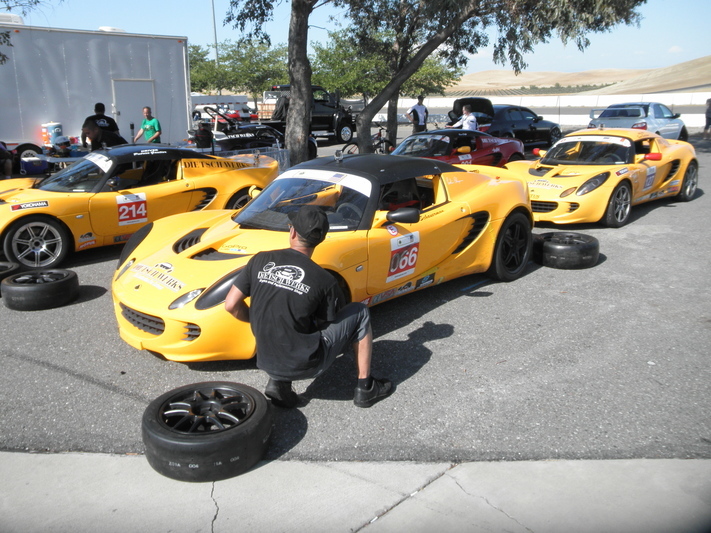 The tires were the normal LotusCupUSA race slicks (left from the previous race, not new ones). The drivers stayed on track and the course workers did a great job of keeping everything on schedule all day. My group (A) had the first 20 minutes of every hour, seven sessions in all. The I and N groups started at 20 and 40 after the hour, respectively. The following picture shows #127 on a line that straightens out the corkscrew as much as possible. Turn three is narrower at the exit than it looks at entry. Round 5 was wonderfully uneventful but with the races both days spent nose-to-tail with me in DietschMotorsports Elise #217 and Jeff E. in Series 1 Exige S (Supercharger Rover K series engine) #55. In both Saturday and Sunday races we were nose to tail the entire race. On Saturday I lead till the last corner of the last lap where he passed me. On Sunday he lead except that on the next-to-last lap entering the main straight a 2 Eleven lapped us and I passed him. Then at the end of the main straight a second 2 Eleven went by and there he passed me and held the lead through the last lap. He is in Cup Class and I am in Production Class, but it sure was fun. We were running with Nasa and using the original track with the bypass (not using the West track). The fastest Production Class lap was 1:59.2 My best lap was 2:07.8. In Sunday's race the front runners in Production were reportedly swapping the lead on every lap. 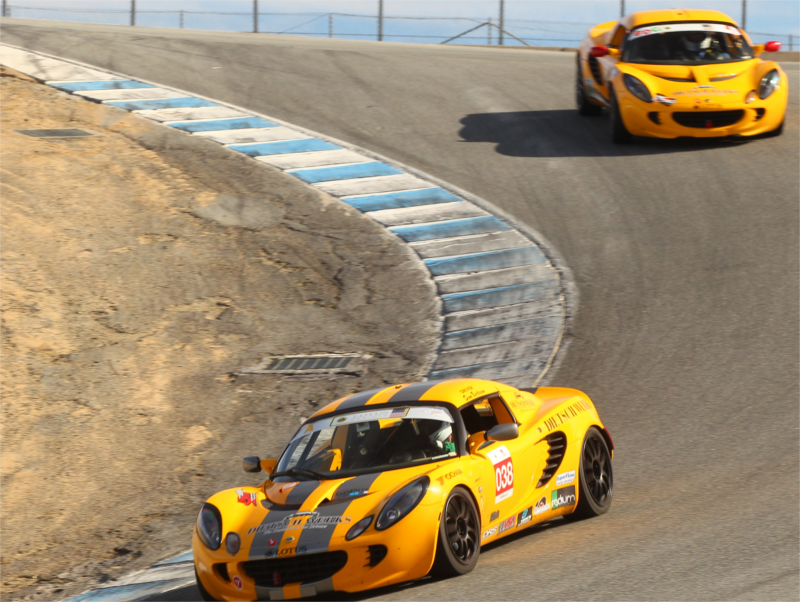 Round 4 of the 2015 LotusCupUSA race series was rather eventful for me. I started in car #313 on Saturday but in Qualifying the engine went from 4 cylinders to 3 to 2 to 1. I pulled off at the early-exit at Turn 5 and got towed back to the paddock. The engine was not repairable at the track. I started the Saturday race in #127 but could not get the engine to run normally. It was in limp mode and turning it off then back on (while on track!) was no help. So I again pulled off at Turn 5 (but motored slowly back to the paddock, no tow needed). By Sunday Rob Dietsch had replaced a very-slightly-cracked fuse in #127 and the car ran normally all day. And it definitely had more power than #313 (both engines are completely stock). Unfortunately during the race a little panel over the fuse box came loose. I pitted to get it removed and returned to the track but now I was in last place (ugh). An incident in Turn 11 lead to 2 cars off-track (one in the gravel) and some debris in the turn. The checkered flag was thrown early as a result and that ended my attempt to catch and pass ... anyone. Not the best weekend of racing. 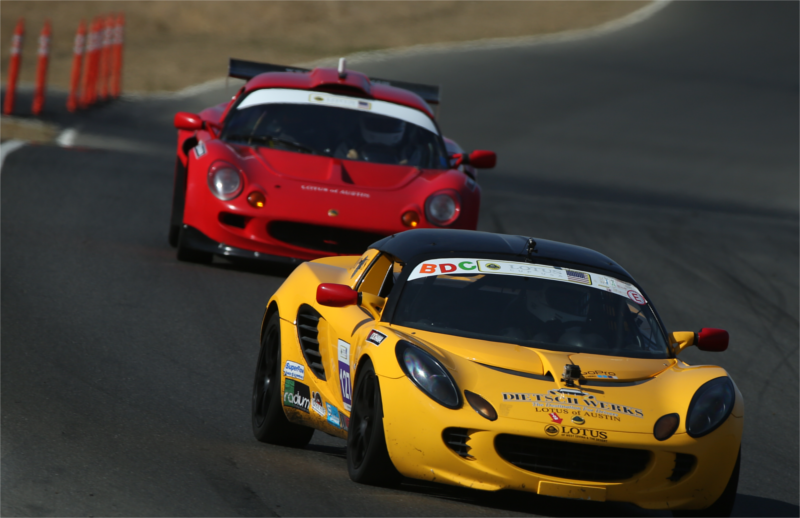 I hope to do better at Thunderhill at the next LotusCup race. GGLC had four twenty-minute sessions on track in association with National Auto Sports Association (NASA). While there was an incident in the morning that took twenty-plus minutes to resolve (while the GGLC group was formed up in the Pre-Grid with helmets on! ), NASA handled it and by afternoon all was back on schedule: GGLC lost no track time. The planned lunch-time track tour (25 mph, no helmets needed) had to be sacrificed though. GGLC president Rita brought the club truck to the track with the club's big cooler and water bottles so GGLC entrants could stay hydrated. (See below, May 25 2014 autocross pictures, for a picture of the truck.) A bit surprising, given that the truck was out at the GGLC autocross at Crow's Landing just the day before! Thank you Rita. Behind me in the turn 3A picture is Steve Young in his beautiful 1962 Lotus 23 in period-correct form. Another beautiful day. Cool in the early morning, perfect driving weather midday. By 3PM it felt cool even in a full driver suit. 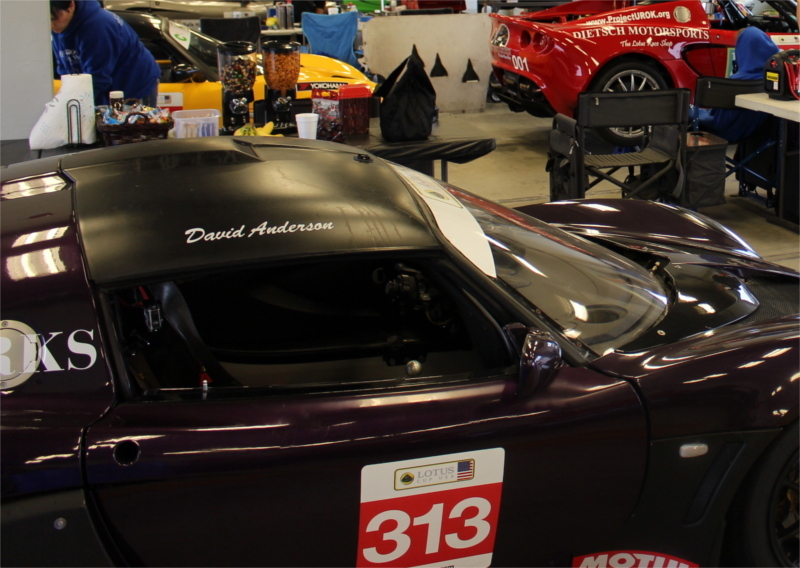 I was driving DietschWerks number 313 (purple normally-aspirated Exige) today. The one in the middle of the three cars (with helmet and Hans device sitting on the roof) DietschWerks brought to the trackday. The above picture copyright Jake Meltzer, used with permission. Thank you Jake! First car went on track at 9AM and the three groups (Advanced, Intermediate, Novice) rotated throughout the day in twenty-minute sessions except that the track closed from 12Noon to 12:20 to give the workers a break. The final session of the day started at 4PM. My best time of day was 1:44.240 which was not as good a time as I was aiming for. In the morning there were lots of cars on track making it occasionally difficult to get clear laps. Simply driving through the pit lane back to the starter (at a low pit lane speed, of course) was usually effective in getting away from a pack of cars. By afternoon it was rare to encounter a big group of cars: even in the fine weather some folks decide to leave before the end of track sessions. It was a beautiful day in Monterey for the last 2014 GGLC track day. 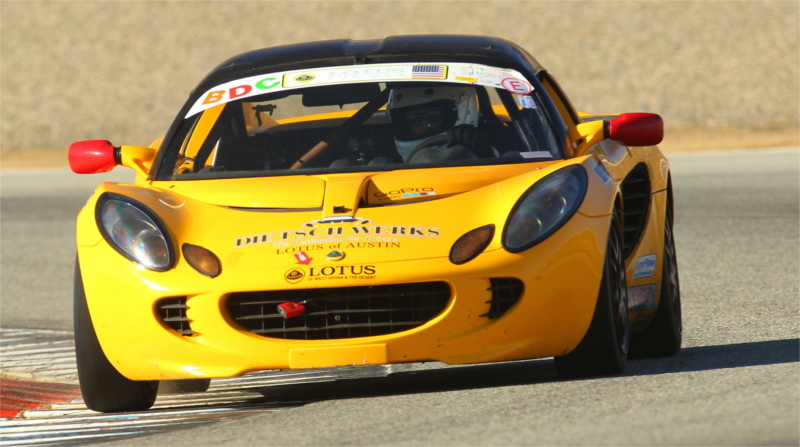 Rob Dietsch, of DietschWerks , brought yellow Elise #038 for me to drive. #038 has Sam's name on the door though Sam was driving #127 today. The following picture shows Rob checking tire pressures. The car was in fine fettle though the track seemed slower than usual: slightly greasy feel that some others mentioned too. I was doing 1:46's which is pretty slow compared to my race times last July. Puzzling, though I now realize I was losing time in Turn 2 --- though a slow turn in any case I was giving up some time at turn entry. 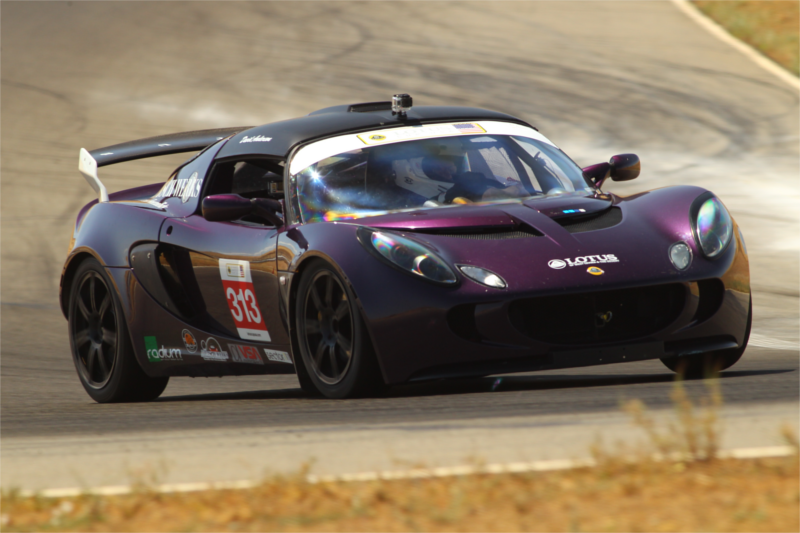 The Lotus Cup USA races at Sonoma had good weather: not hot but sunny most of the day and with a pleasant little breeze. 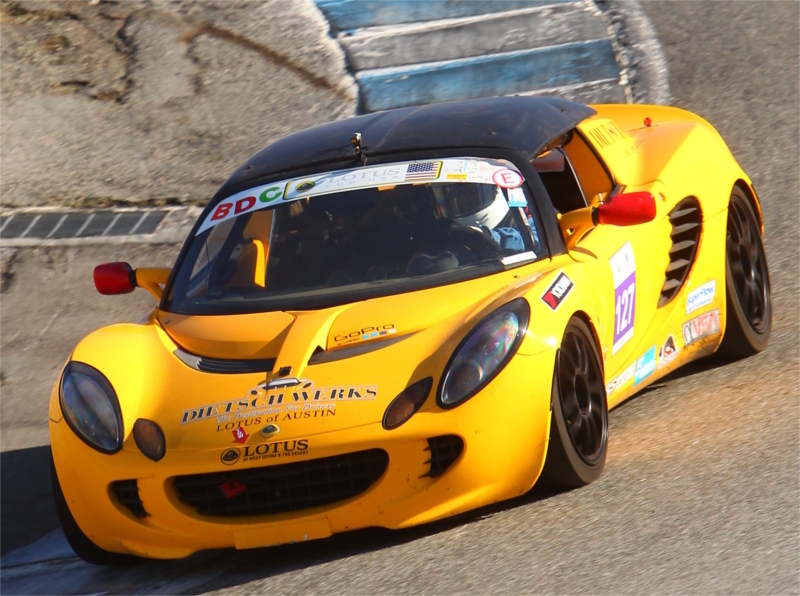 The same DietschWerks Lotus Exige #313 was mine for the weekend and it ran very well. On Sunday morning a connection to the speedo/tach panel was intermittent so in the second practice I rarely had any gauges. It was an annoyance because I often use the point-on-track where I hit 8000 in 3rd in corner exit as a measure of corner performance. But the DietschWerks crew removed the panel and fixed the problem before the Sunday race. My best time of the weekend was 1:51.035 which was not far off our Production Class leaders in the 1:49s. Top Time of day was around 1:43 in the Open class. The DietschWerks driver team: myself, Patrice, Randy, Ross, and Sam were all putting in new personal best times. Ross came in second in Production Class Sunday and Patrice came in third sunday. LotusCupUSA provides two or three track experts every weekend who suggest particular things after sessions (individually, privately) tailored what we've done in the session. As part of the service LotusCupUSA provides. Their suggestions (essentially three to me this weekend) improved my lap times perhaps 1 second (!) and made the laps safer too. Getting the advice of a qualified expert is a good idea. It's an iterative process: as you get faster the advice changes to reflect your progress. A year ago I'm not sure I could have used the advice I got Sunday. 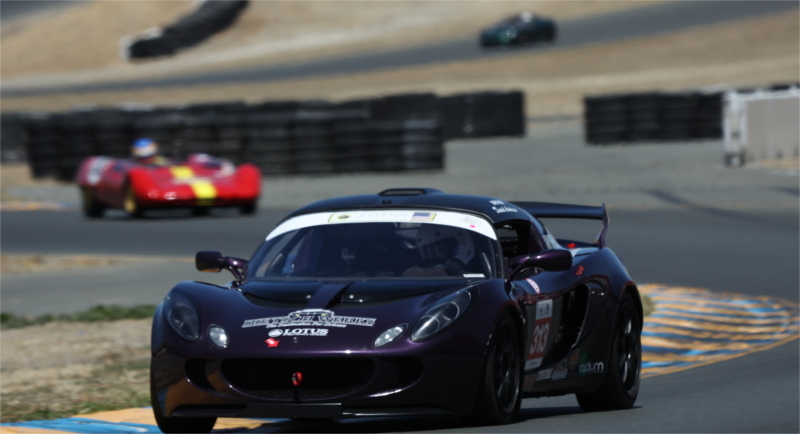 The Lotus Cup USA race group this weekend was smaller than last year's but there was a lot of close racing and some very fine times achieved. It was perfect racing weather: sunny, cool, and with a light breeze. 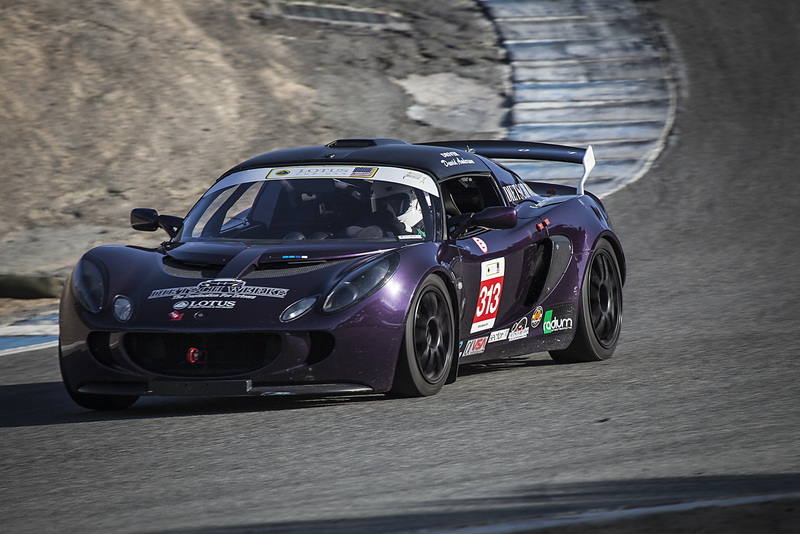 I drove a DietschWerks Lotus Exige #313 for the weekend, the same Production Class car as at Thunderhill but with a new cam (the old one had the typical Elise wear) and with a tiny (but crucial) bit of corrosion in a fusebox fixed. So #313 ran well all weekend. Thanks to Rob and Jen Dietsch and the crew for making this a great weekend of racing for the entire team of five drivers: Ross, Randy, Patrice, me, Terrence. 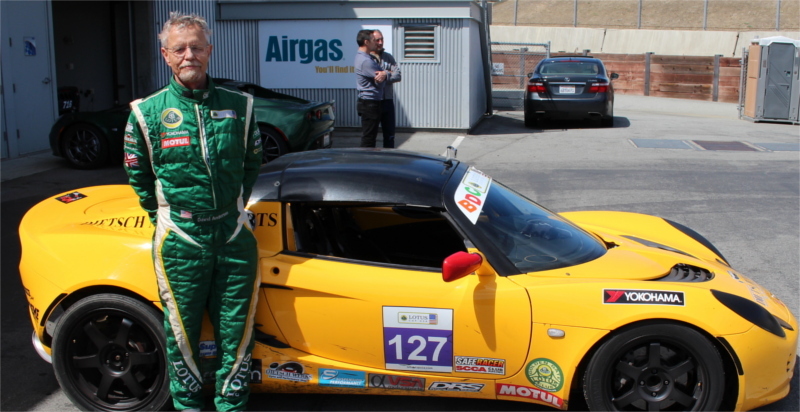 Winning the Sunday race overall was Dave M in a Lotus Evora turning 1:33 laps. Very quick indeed. Ross, the Production Class winner, was turning 1:39's (the best I recall for Production Class in previous years was mid 1:40's) In the race I was turning consistent 1:42's (a new best for me) so I was pretty happy even though that just put me in 8th place out of 10! The weekend was also a major Tesla (and other EV) gathering including lots of Teslas on track at the trackdays Speed Ventures put on this weekend. 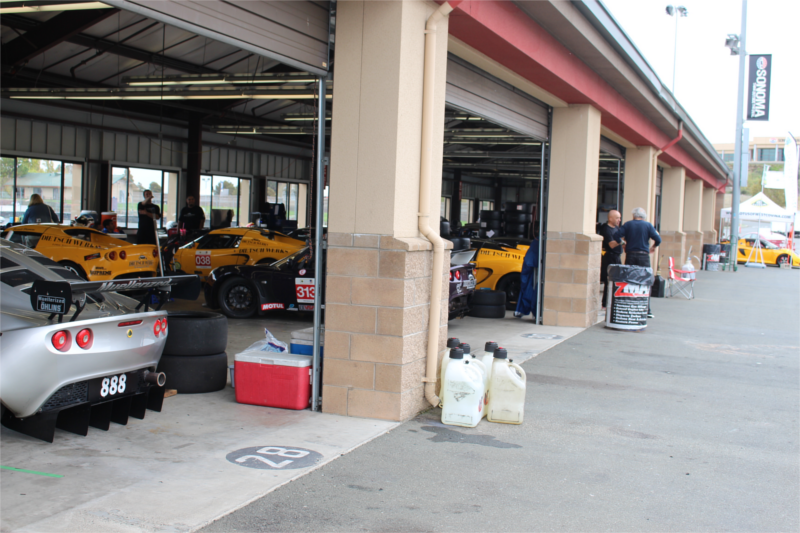 (LotusCup USA had 8 track sessions, 4 each on Saturday and Sunday). When Judy and I pulled into the Hyatt Monterey hotel on Friday in our new Tesla Model S we were more than a little bit astonished to see so many Teslas in one place! Photo:#313 entering the CorkScrew. Credit: Joel Lipkin. 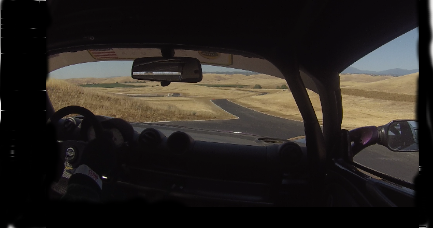 It was a hot weekend at Thunderhill. 103 degrees F Saturday, 111 Sunday. 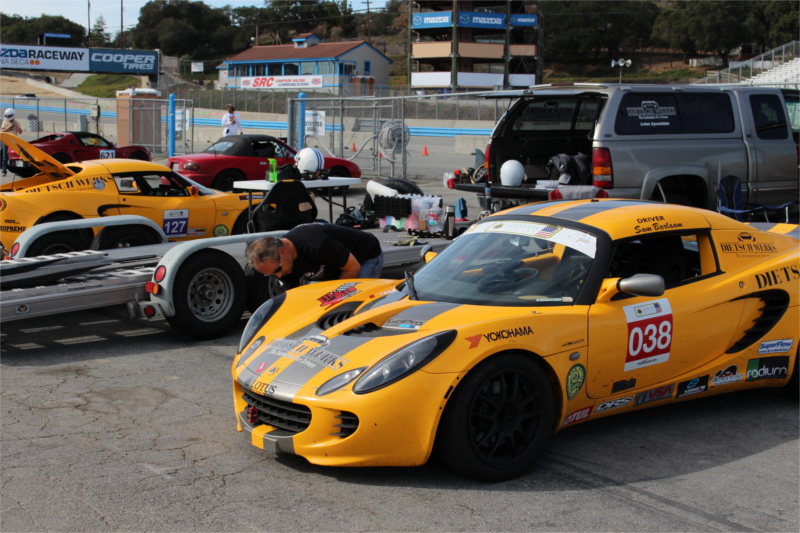 LotusCupUSA was racing in conjunction with Hooked-On-Driving (HOD) running several groups on track. There were few incidents on track (none serious) and HOD did a great job getting things back on schedule and keeping everyone aware of what group was next on track. Saturday morning all drove the full five-mile course in its first use (the white paint edge lines on the West track got done on Friday!). It is very complicated and has large elevation changes. As a five-mile course there are 27 turns! But at the Saturday noon break the track folks discovered a separation where new rejoins old. Not unexpected. It will be fixed soon. Here is a taste of the new West track. Approaching Turn 9 going uphill, a connector heads off to the right and you climb to the new highest point on the entire track. A sharp left and right and you get a view down the track, and what follows is that view. It is a very-fast rather-straight downhill with good sight lines all the way to a left and right pair of moderate-speed turns (the turns not visible in the photo). Next is a picture of me on course on Saturday in my DietschWerks Exige on the old part of Thunderhill (copyright Dito Milian, GotBlueMilk.com): Note the non-standard wing for a 2006. Rob Dietsch installed a new transparent rear window replacing the hard-to-see-through Exige wire window (from when the body was on a car with a supercharged engine) that was there. But the stock wing would not fit so Rob got a one-weekend exemption for having the wrong wing. It helped (one guesses) that the Lotus Cup president, Robbie Montinola, knows me and knows I was unlikely to be in the front of the pack anyway. The first order of business Sunday was installing new race tires for the races and qualifying. Showing 066 before it got my name applied as well as the DietschWerks transporter and a couple of the DietschWerks staff (good people, all of them). The scuff marks on the number 066 were a paddock incident with tires or something many months ago, not contact on track! Three others were running production class Elise's from DietschWerks: Sam, Patrice, and Ross. Ross is incredibly fast, running close to 2 Eleven and Evora times, but on Sunday morning in qualifying noticed the transmission was not going into 4th well and finally would not go into 4th at all and then overreved the engine because got into the wrong gear (on most tracks 4th is the most-used gear in a production Elise/Exige, though 2nd through 5th see use). So Ross was out of both Sunday races. Unfortunate, but that's racing. 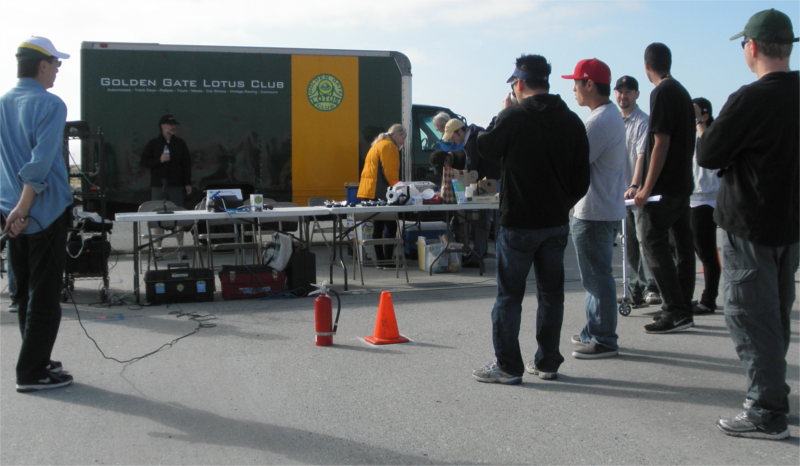 GGLC Autocross #3 at Marina Municipal Airport, I trailered the 90 miles to the event. Sunny, 75 degrees F by noon and little to no wind. An entirely pleasant day. The event was fully subscribed with 3 run groups. Each group got 6 runs in the morning and at least 6 in the afternoon, though I had to leave by lunchtime due to other commitments. 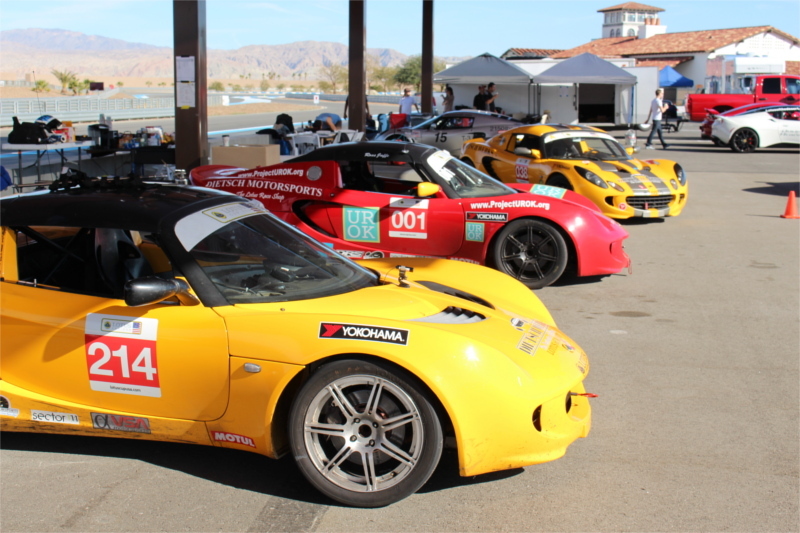 The Lotus contingent was 12 Elise/Exige, 1 Europa (with an aluminum block V6 for an engine), 1 Elan (#371, stock), and a Super Seven. Elan was the only car in Lotus Classic Stock class... Picture of Elan on course courtesy Dave Ellis. Here we see an Elise at the startline and the starter waiving the green flag (not the best picture...). In the background is the "chevron" lineup system, a really cool system that means you run, return to your spot in the chevron, and wait for your turn to move back to the start line. A bit hard to get the idea with this picture, but perhaps it helps. Really pleasant and efficient system for everyone. Here the morning driver's meeting is assembling and in a couple minutes all will hear the safety and work and competition rules for the day. That is the GGLC truck in the background. Not just one trackday, no. Two. Perfect cool and sunny weather both days. 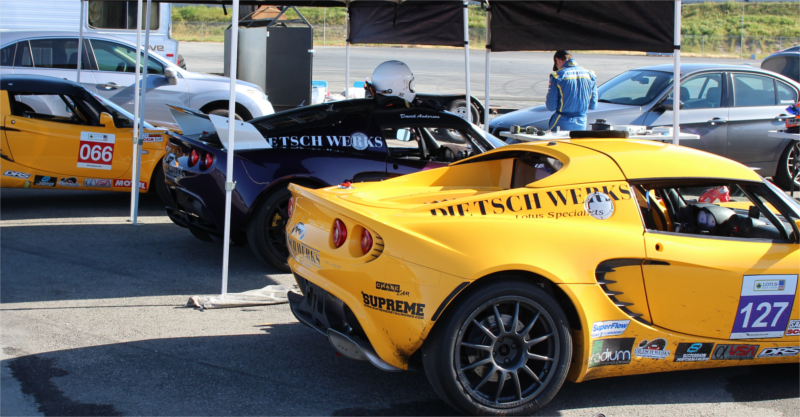 I was driving Lotus Exige number 313, one of the four normally-aspirated Lotus Elise/Exige that DietschWerks Motorsports brought for the weekend (the cars and transporter are pictured ). Rob Dietsch and his team had changed the exhaust on all four to be stock parts and as a result the 90db sound limit was not a problem at all. In the morning we had 3 groups running 20 minute sessions and in the afternoon we had 2 groups (some drivers had to get back to work or wanted to leave before commuter traffic got heavy so we combined groups). I drove 3 20-minute sessions in the morning Friday and six or seven sessions in the afternoon and was happily improving my times. Best lap was a 1:43.8 and I was consistently in 1:44s. To do well in the LotusCupUSA race here I'll need to find another couple of seconds... Some folks at the Dietschwerks trailer were long time instructors at this track and their suggestions were immensely helpful. Every track day is a learning experience. Saturday I had other things I had to do, so after snapping some photos I had to leave without getting on track.